Graduation speech, why lucky superman underwear represents happiness. Have you ever been in a sing at the top of your lungs into your hairbrush, dance around your room in your lucky superman underwear kind of mood? Of course you have, but what good is life without that feeling everyday? A person cannot go through life satisfied without keeping themselves happy. Throughout our lives things come and go that give us the luxury of happiness. While not all of us are lucky enough to own a pair of lucky superman underwear, we can all get a pair. Which is why every high schooler should own a pair of lucky superman underwear. I know what your thinking, this is a graduation speech why is she talking about underwear? Wheres the wisdom? Wheres the advice? Look out class of 2010, here it comes. No matter how far you get in life none of it counts unless your happy, and you keep yourself happy throughout your life journey. What does that have to do with lucky underwear you ask? Well I'll tell you, it has everything to do with it. Think of your lucky superman underwear as your self esteem, without your underwear or your self esteem you feel naked and unhappy. As Lex Luthor said “why does the phone always ring when your in the bathtub?” Because life takes every chance to rain on your parade, but with great self esteem the rain doesn't bother you. It just gives you an excuse to dance. Without great self esteem you could never be happy enough to dance in the rain, you would stand there and let it drown you, with your dreams, and not to mention your superman underwear getting all wet and soggy. Superman blue just isn't the same when its dripping with rain water that hasn't had the funky chicken danced in it. Great self esteem will keep you happy. But great self esteem is nothing without someone to share it with. 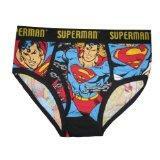 Think of your lucky superman underwear as not only the coolest thing you'll ever own but also your best friend. Without a best friend and without your underwear you feel lost and alone, and probably really uncomfortable sitting there listening to my speech. Self esteem means nothing when you can't share your accomplishments, and a smile with someone else. As superman said “We're all part of a team.” This is true, what good is a smile, or accomplishment, or even a good feeling, without someone to share it with? You can't be happy alone, and you definitely cannot wear your lucky superman underwear everyday as I'm sure your mom has told you, but luckily a friend can be there everyday. Friends will keep you happy, when self esteem isn't enough and when yourself isn't enough. But friends are no good when they can't except your opinion and your beliefs and trust you to make the right decisions for yourself. Think of your lucky superman underwear waistband as an example of your strength and the superman symbol as an example of your beliefs, the beliefs other than reading superman comics under your comforter with a flashlight at midnight I mean. Without the waistband your underwear would be on the ground and your face would match the red of the big superman S, and without the superman symbol they just wouldn't be superman underwear now would they? So without either your nothing but a thin layer of skin, a blank canvas, for others to write on and judge. As Lois Lane said “You're going to end up fighting ever elected official in this country” You may end up fighting everyone from your mom to your best friend to your dresser drawer when its hidden your lucky superman underwear again. But then again, I've never met a happy person who's life is run by others and who has no opinion or beliefs, and no backbone for that matter. Strength and beliefs will keep you happy when your friends are being Debbie downers and your self esteem has flown south for the swimsuit season..
© Copyright 2019 ForeverAndADay. All rights reserved. So, I am almost 30....eeek!